The Biscuit de Savoie, is really a cake, a very very light sponge cake, normally made in an attractive Kugelhopf shape mould. Its origins go way back to the 14th Century, when in 1358 in Chambery the Count Amadeus VI of Savoy asked his pâtissier to make a cake as light as a feather. The occasion was dinner with Charles IV of Luxembourg. The chef asked to create this cake was Pierre de Yenne. Yenne is a small town on lake Bourget, where to this day they claim to be the birthplace of this speciality. The recipe was refined over time with the addition of various flavourings: lime zest, cinnamon, orange blossom, vanilla etc., and icing sugar by Francois Massialot in the 17th century (who published anonymously the first dictionnaire de la cuisine, entitled ‘Nouveau cuisinier royal et bourgeois’ in 1691). He referred to the biscuit de Savoie as a gâteau. The Biscuit de Savoie is very popular in the Savoie and Haute Savoie and can be seen in patisseries and on dessert tables throughout the region. 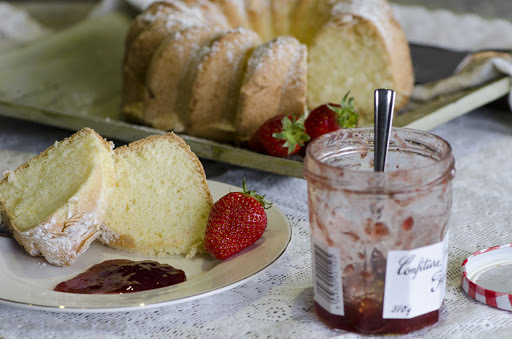 A great tea time cake, it is often served with fruit, jams or a creme Anglaise. During my research of recipes, I discovered a few variations of types of flour used 50% of either corn flour and wheat flour or potato flour. I have slightly adapted this recipe which I found in France Magazine but originated from Bocafina an event management and culinary school in Talloires on Lake Annecy. Preheat the oven to 190℃/gas mark 5. Grease a round 20cm shaped mould or baking tin and dust with flour before sprinkling the flaked almonds around the base. Separate the egg whites and yolks. Be careful to keep the bowl for the egg whites grease free. Whisk the egg yolks with half the sugar and a drop of orange flower water or vanilla essence until the mixture is very pale and thick. Add the sieved flour and cornflour without mixing them in. Melt the butter and allow to cool. Whisk the egg whites, adding the rest of the sugar halfway through, until they stand in peaks. Spoon the egg white mixture into the yellow mixture along with the cooled melted butter. Fold it all together. Pour the mixture into the mould and put it into the pre-heated oven. The cake should be ready in 30 minutes, you can insert a skewer, which will come out clean when it is baked. Allow to cool before removing it from the mould/tin. Serve with fruits, jam and/or creme Anglaise.This was the only recipe I found that used butter, most other recipes had no fat in. I think this cake would be lovely served with fruits marinated in alcohol too, the flavour reminded me of English sponge fingers. Why not pin this recipe for later! We were just in the region and enjoyed many of the foods on your blog. I would love to try to make this Biscuit de Savoie if I can get the conversion to US measures right. I found your blog searching for the way to make Genepi. Sounds so easy to make, but we have to find the wormwood flowers. Thank you for your comments Robyn, great that you sampled some Savoyarde food on your trip to this beautiful region. As a rule of thumb, I normally work out that 25grams = 1oz as a conversion rate. Hope this helps…Bon Appetit! Yours is the first recipe I came upon when searching out Biscuit de Savoie, and it is, as you say, elegantly light. I prefer it with tea, hubby tops his with ice cream. Have yet to prepare this cake with orange blossom water in lieu of vanilla . . . but next time! Thanks Melodie, I’m pleased you like the recipe. It looks lovely. I haven’t come across this cake before.. I would certainly try it in France, I’m not sure that I’ll get to baking one at home, although it looks simple enough. 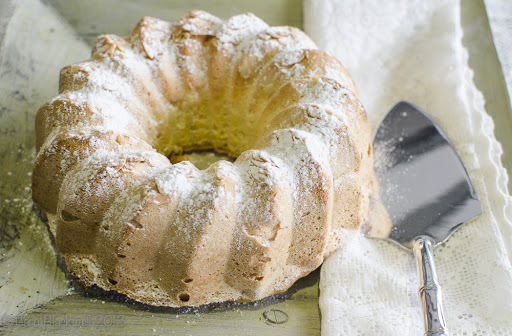 This recipe is worth a try, lovely light cake – the flavour reminds me of sponge fingers! – great to be part of the #AllAboutFrance linky!